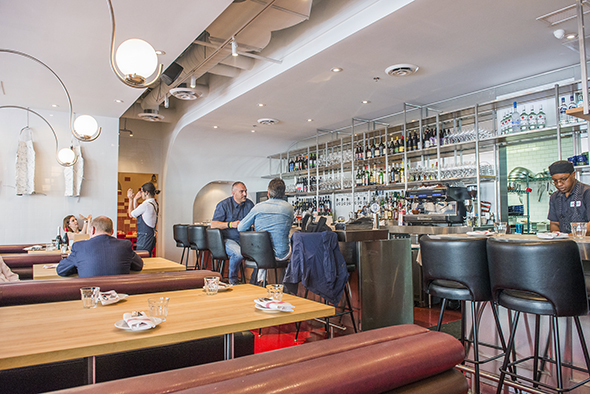 Locale is the newest venture from the local Italian restaurant chain Mercatto. 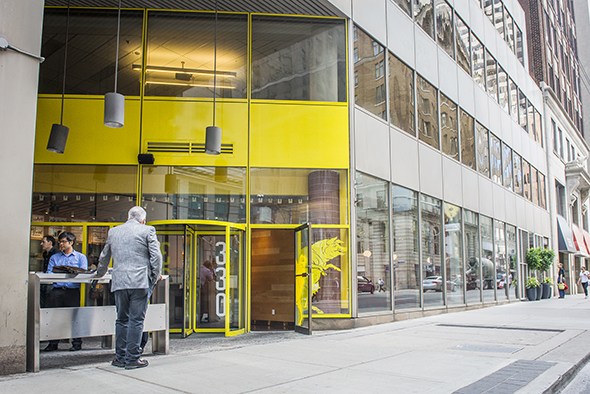 Even though it's located on Bay Street, in the heart of the Financial District, the space seems bright and airy - and while the food here isn't cheap, it won't break the bank either. 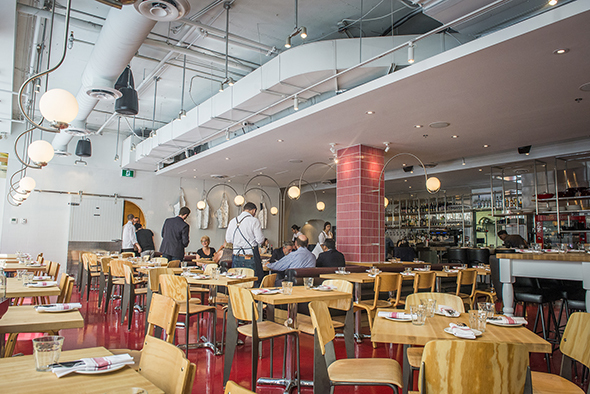 Now, this outlet isn't exactly a new one for Mercatto. 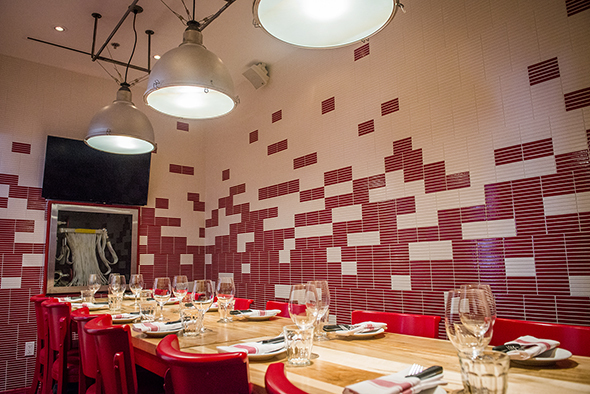 This space, however, has undergone an extreme makeover and is no longer a trattoria focusing on carb-heavy meals (i.e. pizza). Instead, the menu features fresh fish and meat dishes - though there's still pasta on the menu. There's a also a separate take-out counter with its own menu. The space itself has massive street-facing windows, red and white subway tiles and a long bar that overlooks the prep kitchen. 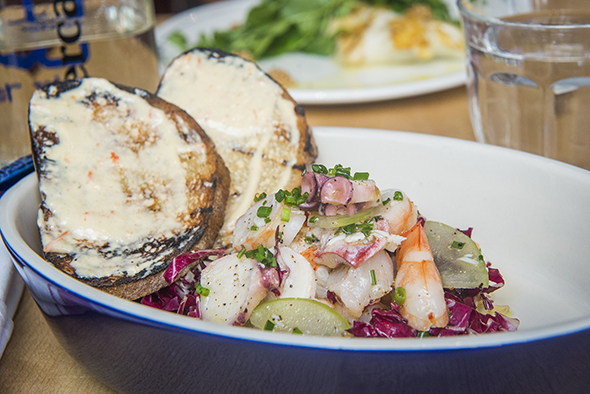 The shareable appetizers, or small plates, include meat, fish and vegetarian dishes. Since it's a 30 C day when I visit, I go for fish and try the seafood sott'olio ($17) with lobster, octopus and shrimp as well as bread topped with a creamy saffron aioli. The whole dish comes off as a little too salty. 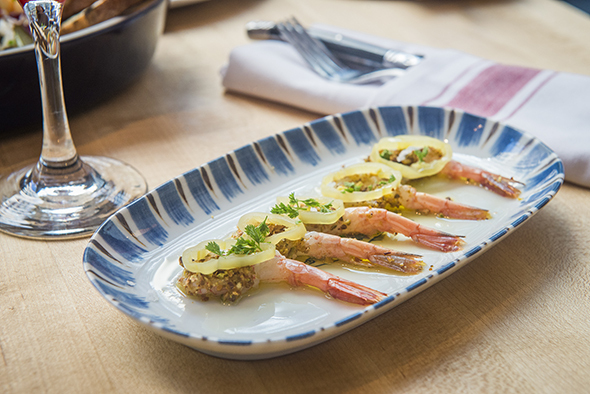 I prefer the shrimp crudo ($12), which has a nice tang thanks to a few well-placed banana peppers. 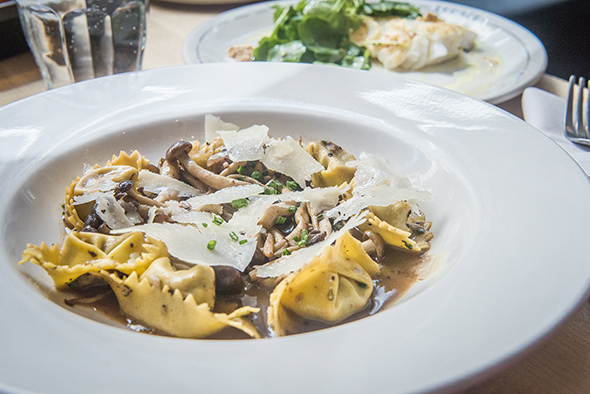 While those dishes are great for groups, you won't want to share the cappellacci ($24). Each made-in-house pasta pocket comes stuffed with duck and the whole dish comes topped with honey mushrooms and a truffle sugo. 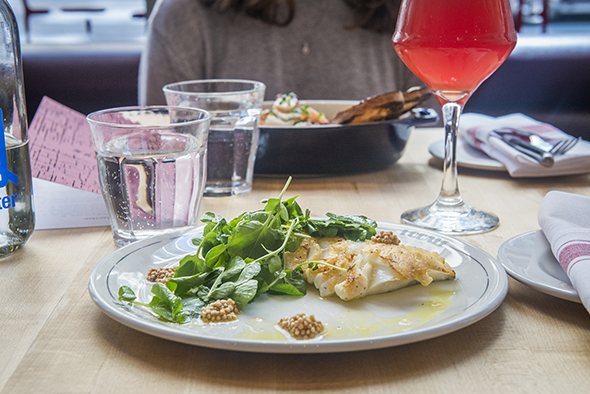 You'll also want to hoard the Fogo Island cod ($22). It's seared flesh-side down and makes for a light, yet quite filling main. 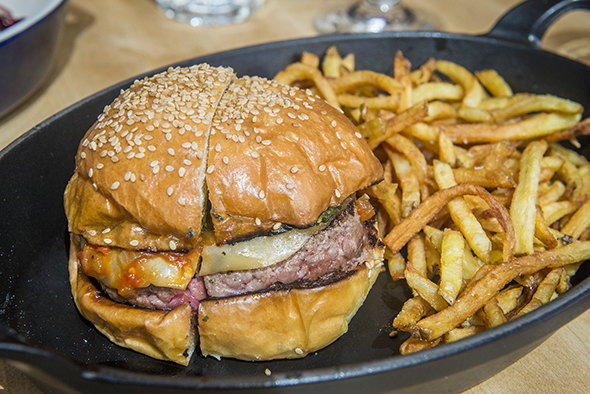 The burger ($21), on the other hand, is a doozy. It's made with short rib and brisket and comes topped with spicy bomba sauce and smoked scamorza cheese. I find it too pink and worry it'll start mooing, but my dining partner deems it amazing. "That's awesome," he says after taking a bite. "That's a really good burger." 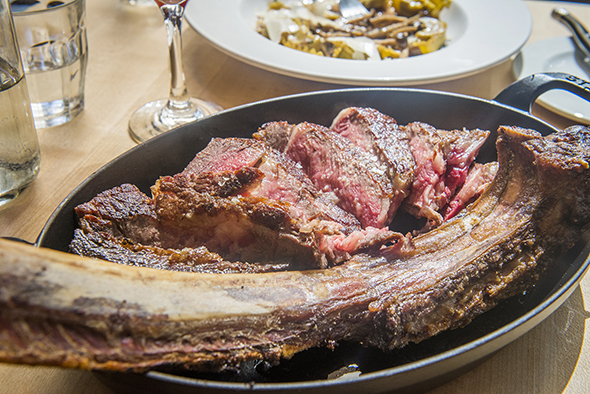 But the piece de la resistance comes in the form of a long bone rib steak ($95). This prehistoric-looking dish elicits stares from passersby on the nearby sidewalk. But don't worry, the 36-ounce steak (that's been aged for 40 days) is meant to be eaten family-style. 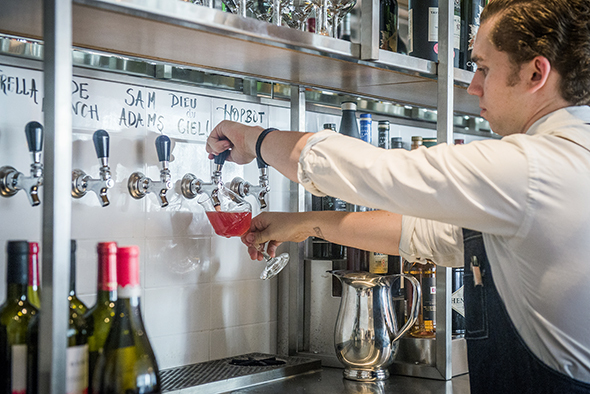 To wash everything down, Locale has an extensive wine menu as well as a nice selection of beer on tap. I grab a glass of RosĂŠe D'hibiscus from Dieu du Ciel! ($9). There are plenty of bottles to choose from as well. With a private dining room, equipped with a TV for lunchtime meetings, it's easy to see how this place would attract Bay Street-types looking to impress clients with a Fred Flintstone-inspired entree. But if you don't feel like eating Bedrock-style, there's still plenty to choose from if you're vegetarian, pescetarian or don't feel like shelling out $95 for a meal.